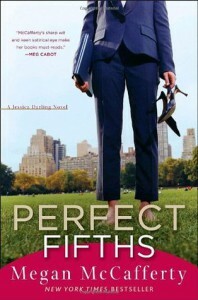 In a departure from the style of the previous books, Perfect Fifths is not told in the format of one of Jessica's journals; instead, readers are given a glimpse into both Marcus and Jessica's heads through an omniscient narrator. This change in narration took away the air of mystery that made Marcus such an intriguing character and replaced it with an immature, less enlightened individual than I had envisioned. It also distanced me from Jessica's character, which is a shame given how much I love her snarky, authentic thoughts. In my review for Fourth Comings, I mentioned how nice it was to see that Marcus and Jessica were talking - even if her journal served as the basis for that communication. The conversations that took place in Perfect Fifths, while pretentious at times, provided evidence of their connection that had been missing from previous installments. It also showed just how much Marcus and Jessica had grown and matured - and, at the same time, just how similar they were to their high school counterparts. Jessica's realization about her feelings for Marcus seemed very contrived. From the Barry Manilow duet to the strange dreams, it just didn't seem real. Worse than that, though, the introduction of Sunny Dae seemed to serve as a plot device to get Marcus and Jessica back together, as opposed to the fleshed-out, sympathetic character that she was intended to be. Overall, I was fairly disappointed with Perfect Fifths. If I'm ever going to reread this series, I think I'll just stick with books one and two.